There are 20 Assisted Living Facilities in the Wilton area, with 2 in Wilton and 18 nearby. The average cost of assisted living in Wilton is $6,741 per month. This is higher than the national median of $3,346. Cheaper nearby regions include Ridgefield with an average starting cost of $6,117. To help you with your search, browse the 177 reviews below for assisted living facilities in Wilton. On average, consumers rate assisted living in Wilton 4.4 out of 5 stars. Better rated regions include Darien with an average rating of 4.5 out of 5 stars. Caring.com has helped thousands of families find high-quality senior care. To speak with one of our Family Advisors about assisted living options and costs in Wilton, call (855) 863-8283. Nestled in the Norwalk River Valley of western Connecticut, Wilton is a town of more than 18,000 with a rich history dating back to 1640. Of its residents, 15.4 percent are aged 65 years and older. Members of this demographic who require assistance with daily tasks may find the care they need at an assisted living facility, two of which are located in Wilton, with 48 more in surrounding areas. In Wilton, and all of Connecticut, assisted living is split into two categories: assisted living services agencies and residential care homes (RCHs), both of which are licensed to operate by the Department of Public Health. For seniors concerned with safety, Wilton is a great option as crime rates are very low. On a scale of 100, with 100 meaning high crime, the town scores 6.4 for violent crime and 12.9 for property crime, which are much lower than the U.S. national averages of 22.7 and 35.4 in the same categories. At 200.4, the cost of living in Wilton far exceeds both the U.S. national average of 100 and the Connecticut average of 118.4, which may be a concern for seniors on a tight budget. The largest factor is the cost of housing, which is nearly four times higher than the U.S. average. For the region, Wilton has a pleasant year-round climate, receiving an overall comfort index score of 51 out of 100. Winter temperatures are usually above 20 degrees and summers are warm, with temperatures in the mid-80s, so seniors can enjoy the town's many outdoor recreational opportunities. Wilton has a number of transportation services dedicated to helping seniors get around. The Wilton Parks and Recreation Department runs a local Dial-A-Ride service, and the volunteer-run program FISH provides door-to-door transportation services to medical appointments. Regionally, the same services are available through Norwalk Transit District's Town-to-Town program and ITNCoastalCT. While it receives an overall passing grade, the American Lung Association, gives Fairfield County an F rating in terms of ozone pollution, something seniors with existing respiratory conditions may want to consider. Assisted Living costs in Wilton start around $6,741 per month on average, while the nationwide average cost of assisted living is $4,000 per month, according to the latest figures from Genworth’s Cost of Care Survey. It’s important to note that assisted living rates in Wilton and the surrounding suburbs can vary widely based on factors such as location, the level of care needed, apartment size and the types of amenities offered at each community. 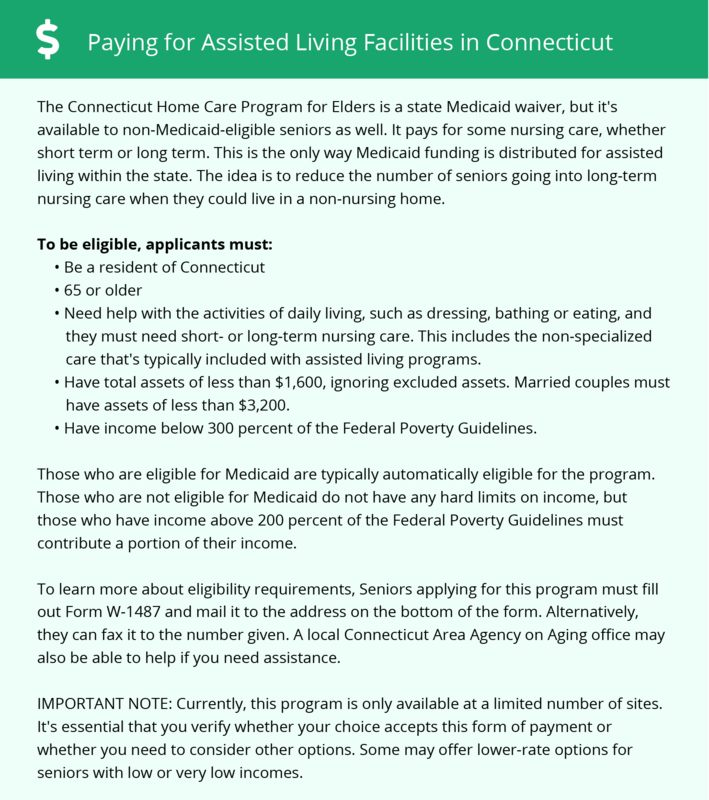 To help seniors afford assisted living services, Connecticut offers state-funded programs in addition to Medicaid waiver programs. For those living at assisted living services agencies, the Connecticut Home Care Program for Elders (CHCPE) can either cover the cost of care services or the full cost of a facility stay, depending on a senior's income. For seniors in RCHs, the Department of Social Services offers an optional state supplement (OSS) to cover the costs of room and board. Learn more about these programs, plus who’s eligible, on our Assisted Living in Connecticut page. For more information about different ways to finance assisted living, visit our Assisted Living in Connecticut page. Wilton and the surrounding area are home to numerous government agencies and non-profit organizations offering help for seniors searching for or currently residing in an assisted living community. These organizations can also provide assistance in a number of other eldercare services such as geriatric care management, elder law advice, estate planning, finding home care and health and wellness programs. To see a list of free assisted living resources in Wilton, please visit our Assisted Living in Connecticut page. Wilton-area assisted living communities must adhere to the comprehensive set of state laws and regulations that all assisted living communities in Connecticut are required to follow. Visit our Assisted Living in Connecticut page for more information about these laws.